With the date of municipal elections – 28.10.2012 – coming closer, the political parties, which have been leading the city of Helsinki during the past, continue preaching one thing and doing another. The city council urgently needs councillors who stick to their word, defend public services and make it possible for citizens to have their say on municipal affairs. Today, major decisions regarding the city of Helsinki are made in a restricted circle. The annual profit of the municipal business units goes over 280 million Euros and yet crucial services for the citizens of Helsinki are being cut. Many inhabitants wish a different development for their city, but their voice is not being heard by the parties in power. 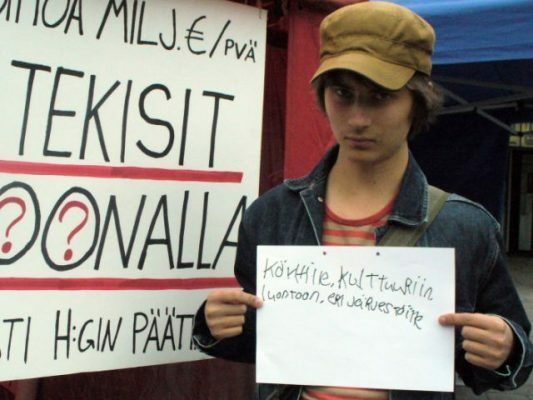 The aim of the home page is to inform about a new alternative type electoral alliance – the Helsinki Lists – bringing together different people and community groups. This alliance which is composed of the List of Non-Party Citizens, the List of Free and Radical Democrats and the List of the Communist Party of Finland – will challenge the restricted circle of the powerful in Helsinki. What type of Helsinki you want? The electoral programme of the Helsinki Lists is not been ordered from a publicity agency, but it is being made up of the results of meetings with citizens, visits in the suburbs and interactive exchange on this webpage. The candidates on this list are not requested to join a political party. Among the key topics are the following: To defend neighbourhood services, to halt the privatization and tendering trend, to act against climate change improving public transport and focussing on renewable energy, to bring housing costs under control, to introduce a new type of urban culture and to end the lagging behind of municipal workers salaries. We look forward to receiving your proposals, your comments and feed-back on our Helsinki Programme. Altogether, let’s carry the citizens’ voice into the city hall!